Now that you have walked through the basics of deploying Hyper-V, creating virtual machines and managing these virtual machines, let’s explore how you can automate many of these activities with PowerShell. Click on the Windows start button, type PowerShell. Run the following command to display a searchable list of PowerShell commands available with the Hyper-V PowerShell Module. To learn more about a particular PowerShell command use Get-Help. For instance running the following command returns information about the Get-VM Hyper-V command. The output shows you how to structure the command, what the required and optional parameters are, and the aliases that you can use. Use the Get-VM command to return a list of virtual machines. To return a list of only powered on virtual machines add a filter to the Get-VM command. A filter can be added by using the Where-Object command. For more information on filtering see the Using the Where-Object documentation. To list all virtual machines in a powered off state, run the following command. This command is a copy of the command from step 2 with the filter changed from 'Running' to 'Off'. The following example shows how to create a new virtual machine in the PowerShell Integrated Scripting Environment (ISE). This is a simple example and could be expanded on to include additional PowerShell features and more advanced VM deployments. To open the PowerShell ISE click on start, type PowerShell ISE. Run the following code to create a virtual machine. See the New-VM documentation for detailed information on the New-VM command. This document has shown some simple steps to explorer the Hyper-V PowerShell module as well as some sample scenarios. 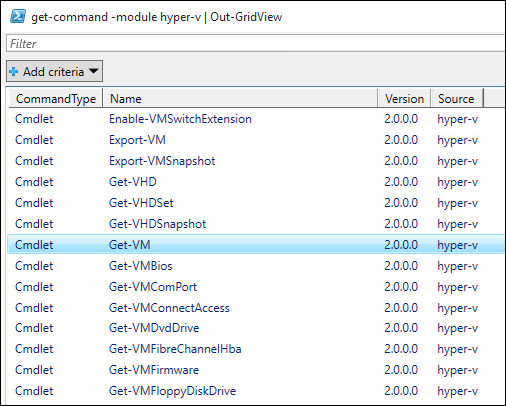 For more information on the Hyper-V PowerShell module, see the Hyper-V Cmdlets in Windows PowerShell reference.